In April I went to Jenni Bowlin's Vintagfest event and bought her January 2014 Mini-Album kit, designed by Jill Sprott. I got it home, spread everything out and was just delighted at how yummy it all was! I remembered seeing Jill's album in the JBS gallery so I knew that it was an awesome design and easy to replicate. Instead of stashing the kit away like I normally do, I determined to use it right away. This week's podcast topic was the motivation I needed! Every once in a while, I have a very inspired idea and this was one of those times! Having the design already determined made it so easy. I love TV way too much and this is proof. Here's my new favorite project I've ever made....I'm giddy over it. This is my favorite part - how it looks all spread out! This is my first time using a board book mini! I LOVE IT! I want to take a moment to say THANK YOU to the incredibly talented Jill Sprott for coming up with such an awesome design that I could use and picking all this awesome product to go in the kit! I'm so happy with the way this turned out. It was such a joy to make this because I knew using Jill's awesome design would work great! Thanks for stopping by peeps! Tracie, I am CRAZY in love with this album! The theme is brilliant -- and I find myself nodding along in agreement with your journaling. I had nearly forgotten about Tony and Angela, and now it's all coming back to me. Ha! Thanks so much for sharing this, page by page. I love your album and your style! 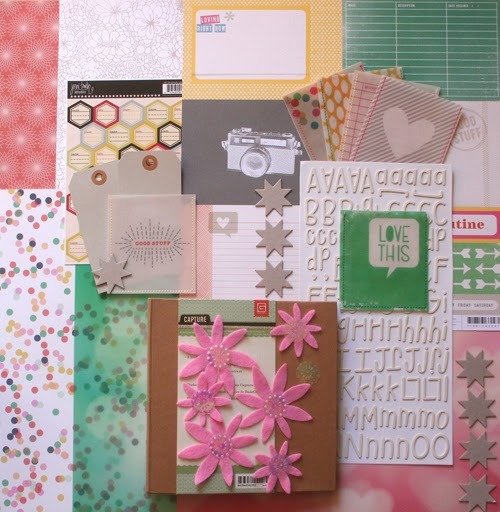 How I miss Simple Scrapbooks magazine! And you totally had me walking down memory lane with Tony and Angela and Rachel and Ross :) and ditto re Dan Stevens! This is so awesome!! What a fun topic to make an album about. I too love the Tony and Angela one. One of my favorite TV couples is the Buchman's (Paul and Jamie) from Mad About You. They remind me so much of Greg and I.
Wow! This is FABULOUS! Love how you journal about WHY each couple is a favorite. Beautiful design...especially the initials for each! your album is wonderful and amazing and i love you more for liking legends of the seeker. So cute! And not complicated! Enjoy your podcast. What a fantastic idea for a mini! Love your arrangement. This is REALLY a cute kit, and I love, love, LOVE the mini album you chose to make with it! It's perfect! Wow! This is amazing! I didn't even know about some of these couples, but you shared just enough in your journaling to make me love them too. Design & colors are fabulous; love the repeated title treatment; girl, you're on fire! tracie, you're so clever! what a fab idea. i recognize some of these couples. cause i love me some tv too. i don't watch grey's anatomy anymore either. it started going a little whacka doodle doo after the 1st couple of years. I love this!! Awesome mini! And what a fun way to record some of your favorite shows! this is a great album! I loved watching some of these same TV shows week after week, for the same reasons-- Different World, Lois and Clark, Wings... thanks for the walk down memory lane! Oh my goodness! This is my new goal, I need to make pages about my favorite TV couples. Why have I never thought of this? Then I think I need to move onto my favorite book couples and movie couples. This is brilliant! It's so ironic, I just found the podcast about a week ago and I just listened to this episode 20 minutes ago. So fun.